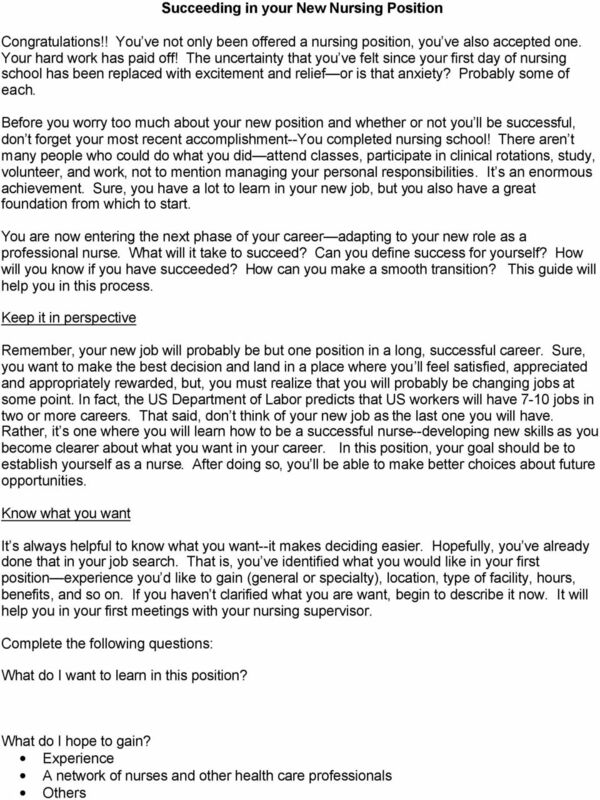 Download "Succeeding in your New Nursing Position"
2 What areas of nursing do I want to develop? How can I do that in this position? How can I contribute to this organization? Describe the skills and qualities that make me a great nurse. What obstacles may prevent me from achieving my career goals? How can I overcome them? What resources do I have? Not knowing the geographical area Feeling unprepared JHU nursing alumni at this facility How long do I plan to stay in this position? Why? How does this position fit in my long-term career plan? Now you have a foundation that helps you understand what you want from this position. Take a look at these questions regularly to help you decide if you are still achieving your career goals. From time to time, review your responses. You ll find as you get more experience, your goals may change and become clearer to you. What does it take to be a successful nurse? 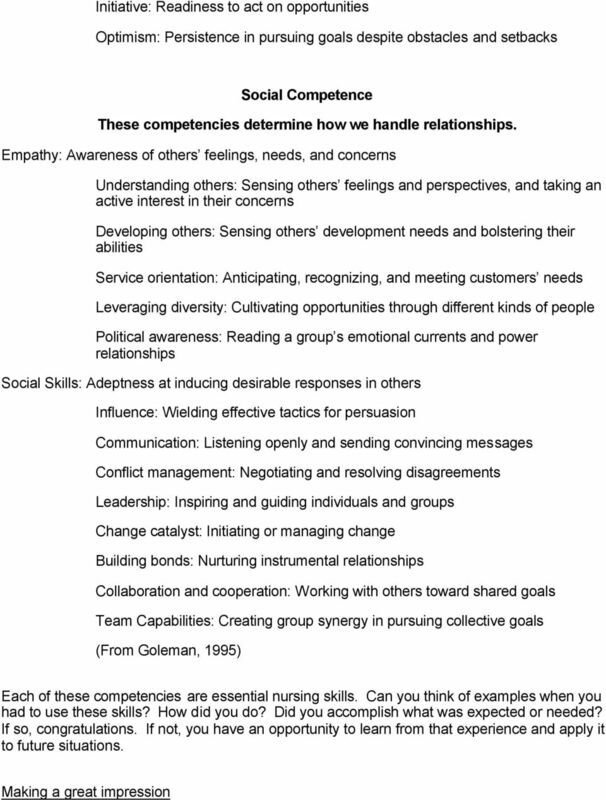 One of the challenges of nursing is that it requires skill sets that at times seem contradictory. You need to have great people skills, but, must also be comfortable using sophisticated technology. You have to be able to comfort your patients and their loved ones but, at times, discuss some very difficult situations with tact and honesty. 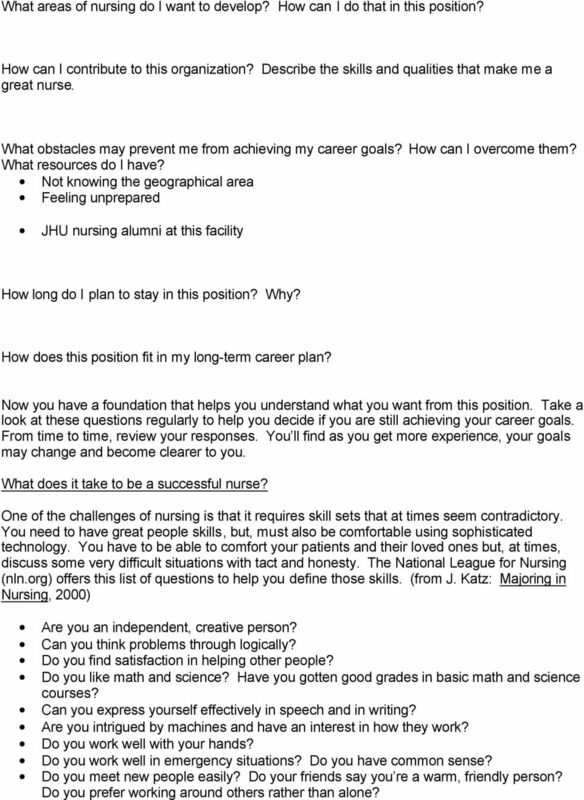 The National League for Nursing (nln.org) offers this list of questions to help you define those skills. 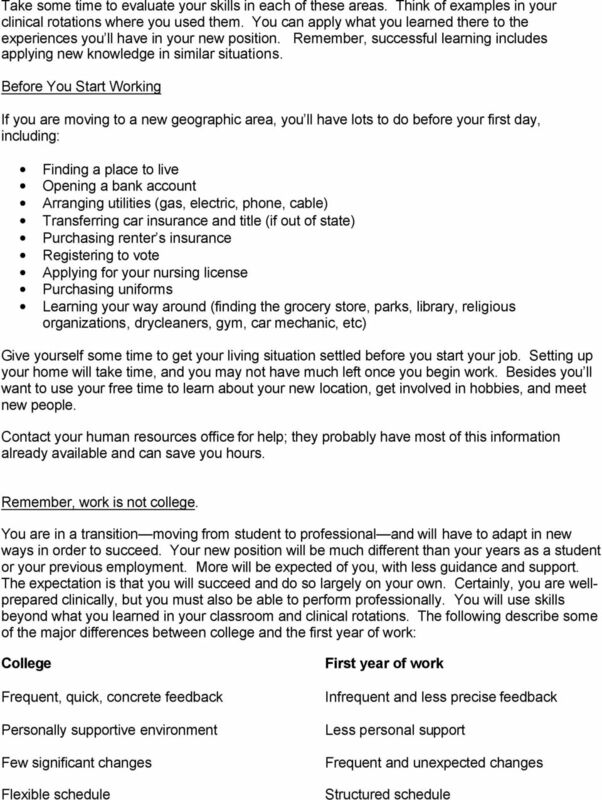 (from J. Katz: Majoring in Nursing, 2000) Are you an independent, creative person? Can you think problems through logically? Do you find satisfaction in helping other people? Do you like math and science? Have you gotten good grades in basic math and science courses? Can you express yourself effectively in speech and in writing? Are you intrigued by machines and have an interest in how they work? Do you work well with your hands? Do you work well in emergency situations? Do you have common sense? Do you meet new people easily? Do your friends say you re a warm, friendly person? Do you prefer working around others rather than alone? 6 Your first days in your new job will be filled with learning the environment, meeting new staff, and taking care of patients. Much will be expected of you. 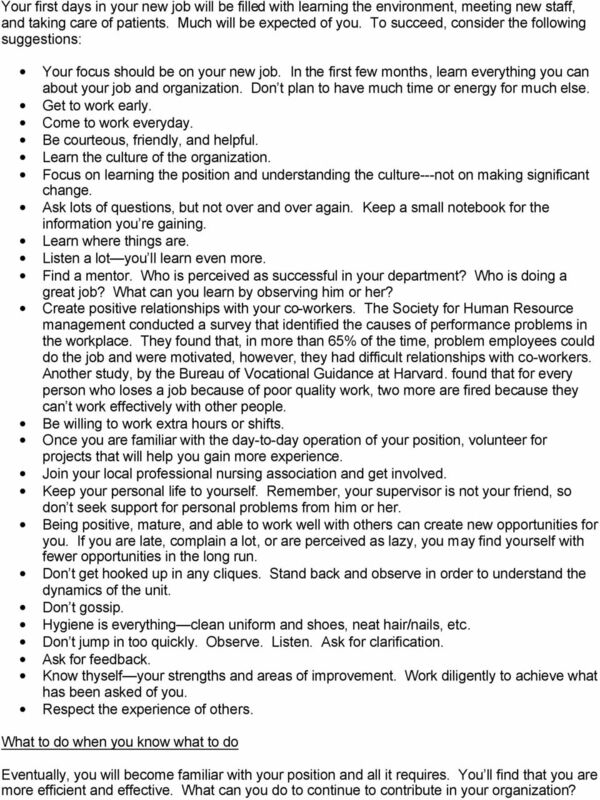 To succeed, consider the following suggestions: Your focus should be on your new job. In the first few months, learn everything you can about your job and organization. Don t plan to have much time or energy for much else. Get to work early. Come to work everyday. Be courteous, friendly, and helpful. Learn the culture of the organization. Focus on learning the position and understanding the culture---not on making significant change. Ask lots of questions, but not over and over again. Keep a small notebook for the information you re gaining. Learn where things are. Listen a lot you ll learn even more. Find a mentor. Who is perceived as successful in your department? Who is doing a great job? What can you learn by observing him or her? Create positive relationships with your co-workers. The Society for Human Resource management conducted a survey that identified the causes of performance problems in the workplace. They found that, in more than 65% of the time, problem employees could do the job and were motivated, however, they had difficult relationships with co-workers. Another study, by the Bureau of Vocational Guidance at Harvard. found that for every person who loses a job because of poor quality work, two more are fired because they can t work effectively with other people. Be willing to work extra hours or shifts. Once you are familiar with the day-to-day operation of your position, volunteer for projects that will help you gain more experience. Join your local professional nursing association and get involved. Keep your personal life to yourself. Remember, your supervisor is not your friend, so don t seek support for personal problems from him or her. Being positive, mature, and able to work well with others can create new opportunities for you. If you are late, complain a lot, or are perceived as lazy, you may find yourself with fewer opportunities in the long run. Don t get hooked up in any cliques. Stand back and observe in order to understand the dynamics of the unit. Don t gossip. Hygiene is everything clean uniform and shoes, neat hair/nails, etc. Don t jump in too quickly. Observe. Listen. Ask for clarification. Ask for feedback. 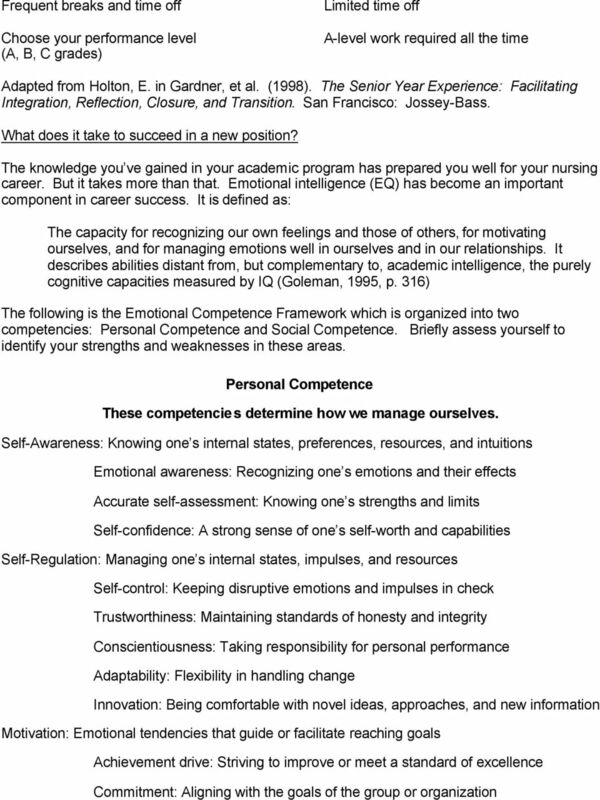 Know thyself your strengths and areas of improvement. Work diligently to achieve what has been asked of you. Respect the experience of others. What to do when you know what to do Eventually, you will become familiar with your position and all it requires. You ll find that you are more efficient and effective. What can you do to continue to contribute in your organization? This assessment process will help you identify developmental priorities for your Individual Development Plan (IDP) for pursuing your career goals. SHOULD CLINICAL COURSES GET A LETTER GRADE? Howard County Library System Customer Service Philosophy: Service is Personal The Team Lew Belfont (Chair) Yao E. Aziabu Katie George Elizabeth M. Haynes Susan L. Stonesifer We are what we repeatedly do.